Wandering the streets of Chiang Mai, or any city in Southeastern Asia for that matter, is an adventure for the senses. The sounds, the sights, the smells – different, exotic and exciting – drawing the visitor onward. At first it all seems rather strange and a bit chaotic. But with time and experience one begins to discover an underlying rhythm and pattern to sights, sounds and activities. It’s all a part of the appeal of the region and what brings so many to Thailand, Myanmar, Laos, Cambodia and Vietnam. Chiang Mai is also all about flavors. The region entices visitors, appealing to their sense of taste – yes, taste – without a doubt. Street foods of all kinds cry out for attention. Street corners, markets, squares, temple grounds – they are all full of venders and stalls hawking street foods of all sorts. 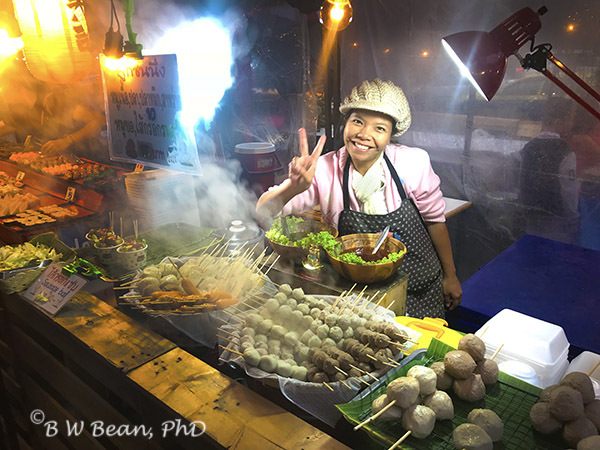 Street food is an integral part of the Southeast Asia experience and an intriguing part of the adventure for visitors. 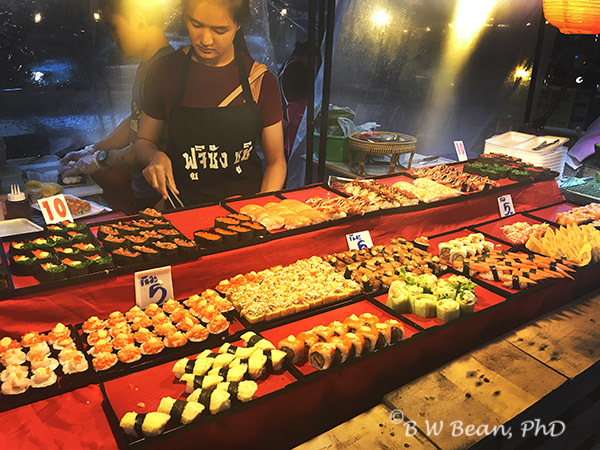 A small street food market sets up four evenings each week about one block from my residence (temporary) in Chiang Mai. At first I was a bit circumspect about venturing into the world of street food. I am, after all, from Kansas City – a place known for barbecue and other main stream American types of food. Not much street food in KC – no – not so much. But with a bit of time and observation I acquired at least a basic understanding of this Chiang Mai street food market and it’s offerings. I tried things. Some I liked – others less so. I now dine at this market several times per week. The food is good, the atmosphere is fun, and the prices are amazingly low. It’s a good time food experience. I’m sorry I can’t share the flavors of the street foods with you here. But I can give you a taste (sorry ’bout that) of the visual experience and the atmosphere of the place in the Video below. TRY THE STREET FOOD ………….. ENJOY THE ADVENTURE! © 2018, Bruce W Bean, Ph.D. All rights reserved. 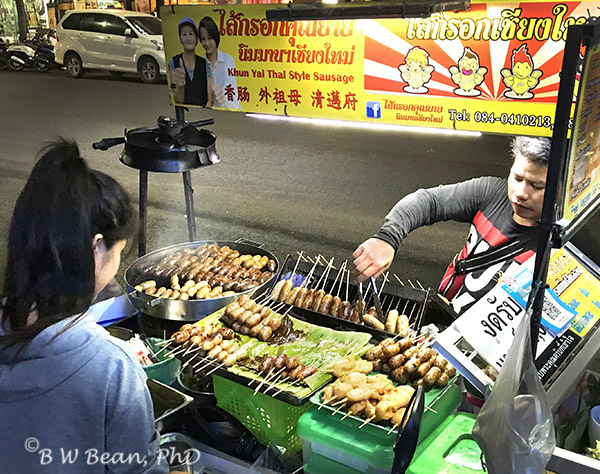 This entry was posted in General Photography and Travel, THAILAND, Travel Tips, Video and tagged Chiang Mai, Street Food, Thailand, video by Bruce W Bean, Ph.D. Bookmark the permalink.